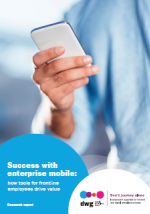 Enterprise mobility can be a game-changer for organizations. However, up to now the focus has generally been on the benefits it brings to workers when they are “on the go”, telecommuting or wanting to use their personal device to access corporate systems. Less attention has been paid to what mobility can bring to frontline workers on the factory floor, in retail outlets or out in the field. In our view, enterprise mobility represents a huge opportunity to deliver digital services to this crucial section of the working population in new and potentially transformational ways – improving efficiency, innovation and engagement. These in-depth case studies show how mobile technology is reaching out to the “digitally disenfranchised”, highlighting the art of the possible in this exciting new area.